All literary agencies represent the interests of their authors to publishers. However, we at the Michael Snell Literary Agency stress idea development above all else. No agent can talk an editor or acquisitions team into buying a poorly developed book proposal, but a well-developed and compelling proposal can and will sell itself. The life of a book follows the same growth and development process as a plant: a seed (the idea) sprouts in the author’s mind, then the agent helps the author nurture it into a seedling (the proposal), sells it to a publisher, shares the author’s joy when the sapling (the manuscript) goes into production, and celebrates the publication of the book (the mighty oak). 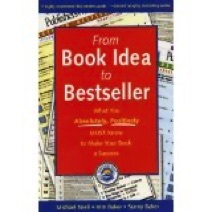 That process explains our philosophy and the title our book, From Book Idea to Bestseller. 1.Work with you to develop the best possible proposal. Our detailed guidelines and a model proposal will help guide your work. It takes new authors (and even seasoned professionals) several iterations before they get it right. 2.Aggressively market your proposal to all of the most likely publishers. We may not find a good home for it, but we will not give up until we have ransacked every viable possibility. 3.Negotiate the most advantageous contract terms with your publisher. Having negotiated over 1000 publishing agreements, we know what we can and cannot demand from publishers. Lawyers often hire us to consult with them on publishing agreements. 4.Oversee your relationship with your publisher and involve ourselves in any necessary problem-solving. You or your editor may need us to act as a marriage counselor from time to time. During our forty years of working in the world of book publishing, we have seen just about every imaginable problem arise, from a publisher going bankrupt, to an author developing Alzheimer’s disease. In addition to the usual idea development, marketing and deal-making services we provide for all clients, we offer developmental editing, rewriting, collaboration and ghostwriting to talented authors who lack the time or wordsmithing ability to fashion an excellent manuscript. We do such work ourselves; and we represent many professional writers who also do excellent work.